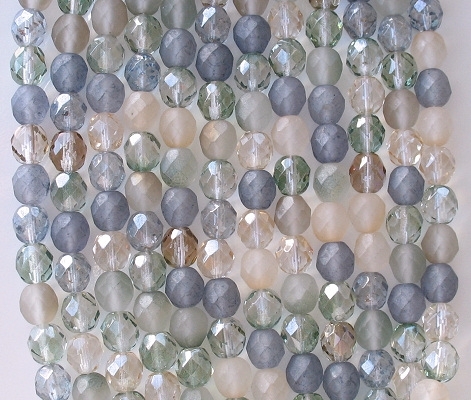 A mixture of colors and textures meant to imitate random glass that you would find on a beach: Light grayish-blue matte, light grayish-beige matte, light grayish-beige luster, light grayish-green luster, light grayish-brown luster, clear matte and possibly other colors. 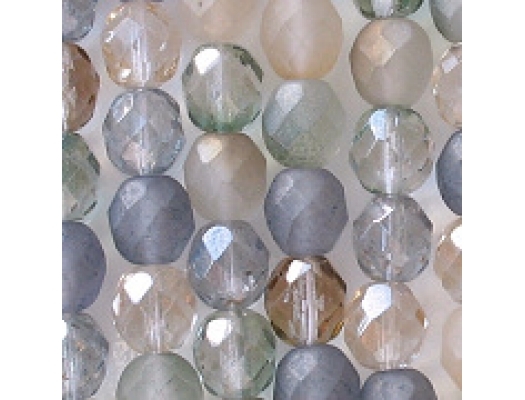 Many beads have their color just on the surface (i.e., not in the glass). I like this mixture of subtle colors. The first time I got these beads, I got them at a steep discount (I think it was 40% off). The second time, the price was higher and I got them at less of a discount (15% off). Thus, my price has gone up considerably, and I'm selling them in lots of 25 instead of 50. I get these beads from one of my more expensive suppliers, a supplier who raises his prices frequently. The picture is a somewhat old picture. The newest batch of these beads is more colorful. 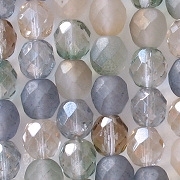 They look more like the 6mm beads (click on "Related Products" above).